Once you have your freelance visa in hand, the next step in the process is to go to the appropriate Finanzamt (Tax Office) to fill out the paperwork required to obtain your "freelancer" tax ID. 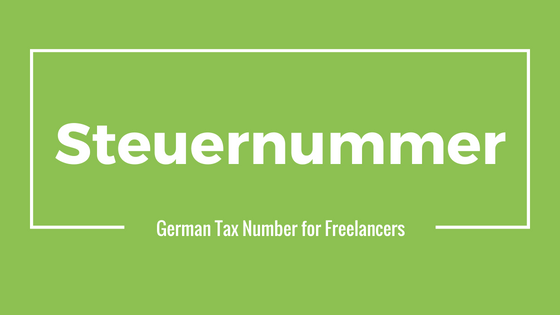 Paying taxes in Germany is compulsory for all residents, and you are unable to invoice for freelance work without the so-called Steuenummer. This Steuernummer is different to the tax ID you received in the mail within a week of registering; this registration tax ID, or Steuer-ID, is very important when you apply for the Tax number at the Finanzamt office, but they aren’t the same thing so don’t become confused with the two. Here is more info about the Steuer-ID. There are a few steps to take to get the Steuernummer and I will list them here, then I will share my experiences at the Finanzamt this past week. First, you need to go to the following website, and enter your postal code to find the tax office specific to your address. 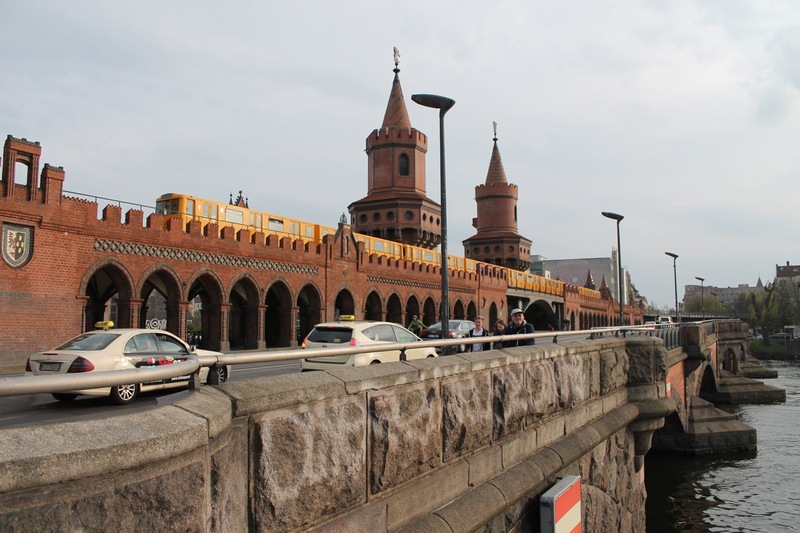 Even though I live in Alt-Moabit area in Berlin, my tax office is the Mitte one located at Neue Jakobstrasse; just plug in your postal code and your office will pop up. You don’t need an appointment at the Finanzamt, but when you arrive you do take a number and have to wait your turn. On Friday at 10.15 am there were three other people in the office besides myself and the woman who assisted me with the visa, Johanna. We were finished by 11 am and I was home by 12 (god love the public transport here in Berlin but it isn’t always the fastest). Second, once you know which Finanzamt office to go to, you need to bring along a few important pieces of documentation: your passport with the freelance visa, the letter you received after registering with the tax ID on it, your Anmeldung (proof of registration) and your rental contract (I didn’t have this with me and so I need to bring the completed packet of papers back to the Finanzamt or drop it in the post); you’ll also need an application form but you get that form at the Finanzamt. This application form is called the “Fragebogen zur Steuerlichen Erfassung” or the Tax Number Registration Form. 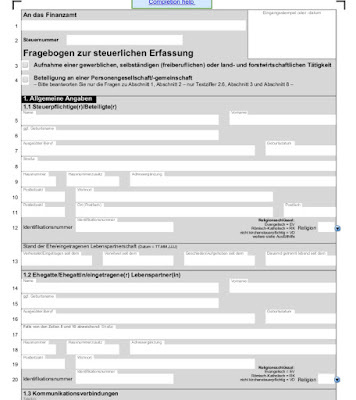 Here is the original German online form to fill out in order to become self-employed. Once opened, that link will be valid for only 45 minutes, so make sure to save it and print it before this time elapses. Here is an English guide to help you out. Johanna informed me that, for whatever reason, the Mitte Finanzamt makes things a little more difficult than the other tax offices do and requires a second application form to be filled in-not an application but a question/answer form specifically detailing what your job is and if it is truly a freelance job and that you aren’t being taken advantage of by local companies (this is my understanding of it, just know that at the Mitte tax office there is a second form to fill out along with the application form). Third, once you have this application (and second form if you are at the Mitte office), be aware it is completely in German and (there is no English translation on this form), you fill it out in the waiting room and sign it. Be prepared to answer whether or not you want a VAT number; Johanna did tell me that she’s learned that marking the box asking for a VAT number is the best way to do it rather than declining it now and then needing to request one later-she said it is a very difficult process to try to get a VAT number later (this is her job and she is fluent in German and I trust her completely but it is up to you when you are filling out the application). Once you’ve filled it out and have made photocopies of your documents (there is a copier in the office for public use and costs 10 cents a copy), you wait for your number to be called. You enter the office and hand over all forms and documents; the tax office worker reviews it all for mistakes and asks questions (remember this is an official State office, so the only spoken language is German-no English). If all is good, you hand it all over and will receive the Steuernummer in the mail within 2-3 weeks; if you need more paperwork/documents, the office worker will write down what you need and you can either return the paperwork in person or send it by post. I decided to hire someone to assist with this step because it is a crucial one and I didn’t want to make any mistakes or have any issues, plus, the application and the meeting with the office person is only in German and I am not fluent. On Friday she met me at the office and we went inside; she asked for the forms to fill out and we spent fifteen minutes filling them out- it is an 8 page document all in German and you need your passport info, your residence visa info and the tax ID (Steuer-ID) you received after registering. Once we filled out all the documents, we got a new number and waited a few minutes before being called into an office; we handed over all paperwork and all is perfect with it, except that I didn’t bring along my rental contract information. So I left the building with the packet of paperwork and need to make a copy of my rental contract and drop it all off at the tax office tomorrow; I was told that within a few weeks I will get my Steuernummer in the mail and can invoice for my freelance work so I receive payment. This step in the process was far less stressful than getting the visa, but it’s still difficult for non German speakers who aren’t familiar with the German tax system. Good luck!